This Alsatian Onion Tart is our third Michel Richard puff pastry recipe in a row! This is a great easy recipe to toss together for brunch or lunch (or dinner) if you have some puff in the freezer already. It’s actually designed to use scrap puff pastry that’s been rerolled, but I didn’t have enough scrap and sacrificed a fresh sheet. It was worth it. This is very similar to the flammkuchen I like to get at German beer hall in my neighborhood (except I think they use a flatbread base instead of puff pastry). It’s almost like a pizza topped with slightly sweet, soft onions simmered in chicken broth, bacon and a touch of cream. I put some fresh thyme on mine, too…hopefully the Alsatians won’t mind. While the recipe specifies four very large onions for the topping, two of my onions were most definitely small and the other two were medium-sized at best. I was crying so freaking much chopping them, I don’t think I could have physically handled anymore. I had plenty for a nice thick layer anyway. I actually thought it looked like too much cooked onion but I put it all on there. Also, I used turkey bacon instead of slab bacon so I skipped the blanching step and just gave it a quick sauté. Oh yeah, and I baked my tart at 400° because I like puff to be a little browner than I’ve found I can get it at 350°. You can prep the components a day in advance and assemble the tart right before baking. The recipe says this tart is best just baked, but I had leftovers that I reheated in a 325° oven the next day, and they were great. Good to know about increasing to 400…I was thinking about maybe pre-cooking the crust a little bit if I made this again just to give a little more crunch. I was totally crying too!! Very strong onions this time haha! I like the idea of baking at 400. Mine have been so pale. Great idea! Yours looks beautiful. I too cried a bit chopping four large onions!! I like how you paired it with the salad. Beautiful. I always love clicking on your links – your blog is so clean looking and your single photos always stand out. Their very large onions must be on the small side… I used three and thought I had too many. This was a tasty one! I had a salad with mine too. Yummy, right! 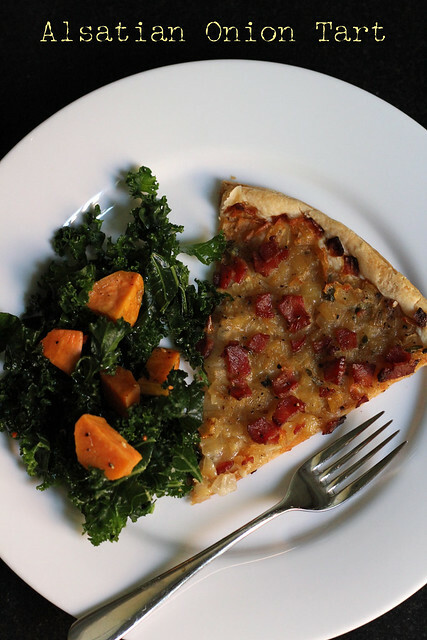 Your tart looks great, but I’m focused on the delicious looking kale and squash salad sitting next to it. I think I need to eat more vegetables! You were smart to cook this at a higher temperature. Mine didn’t brown enough. Why must this look so good! ?